The Extrication Short Cuff Gloves from Ringers are tough, dependable and optimized for use by EMS, fire and rescue, and first responder teams. The gloves feature a unique Armortex fabrication on the fingers, knuckles and palms that is resistant to punctures and abrasions. The ultra-durable material is stronger than leather, yet allows the users to retain higher levels of dexterity and feeling. In fact, the gloves retain so much feeling that users are able to palpate a pulse without ever having to take them off. 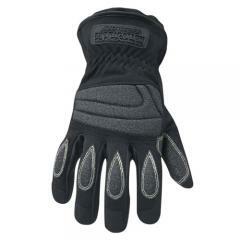 This allows the wearer to perform lifesaving rescue maneuvers quicker and more safely than with traditional gloves. With the enhanced dexterity offered by these gloves, users can handle recuse tools confidently and securely regardless of external conditions. A tough elastic cuff provides added protection and guards against broken glass and other dangers.